This article first appeared in the St. Louis Beacon: The so-called South County Connector is years – if not decades – away from being built. It doesn't have funding and is for all intents and purposes simply an idea -- not a done deal. But that isn’t stopping a broad coalition from speaking out – loudly – against the proposal, which aims to ease longstanding connectivity problems between northern and southern St. Louis County. The project – which is going through an environmental impact study that’s required to be eligible for federal funding – is facing stiff opposition from municipal officials, some St. Louis County businesses and trail enthusiasts. Critics say that the project could harm Maplewood's economy, have a negative impact on trails and parkland and add more to a road-heavy region. But proponents see such benefits as reducing regional traffic on local roads, making it easier to get to the Shrewsbury Metro station and easing the commute between north and south St. Louis County. With literally hundreds – if not thousands – of people providing feedback on the project, St. Louis County officials plan to wade through public comments and decide whether alter the plan. But the point person in the county’s transportation department says the project has plenty of potential. "It’s going to help a lot of people," said John Hicks of the St. Louis County Highways and Traffic Department. "I think a lot of the opposition is playing on people’s fears. And I can’t stop that or prevent that. I can only present the information that we have developed." The origins of the South County Connector, Hicks and Dooley say, go back to the need for a north-south expressway in St. Louis County. That was initially the purpose of Interstate 170, which starts in Richmond Heights and extends to north St. Louis County. Hicks said it was easier to build I-170 northward because the area was more open. Building the road southward, he said, ran into opposition – primarily because of industrial and residential centers. 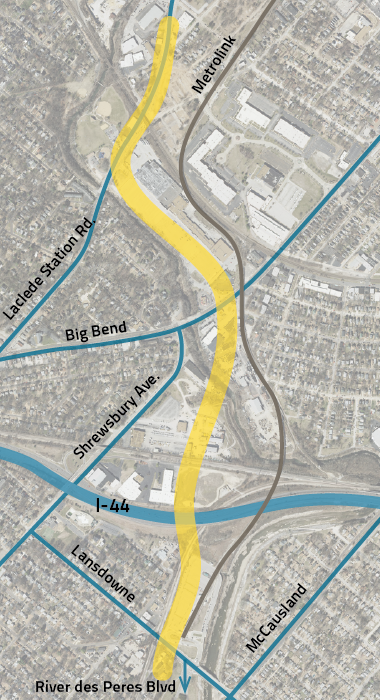 The MetroLink route that goes from Clayton to Shrewsbury had been designed and promoted as a substitute for a south St. Louis County connector. The above map shows the general location of the build in the Environmental Impact Study. St. Louis County Executive Charlie Dooley emphasized that there is no particular route. There is no design route. It’s just corridor. According to the department, the South County Connector would extend from Hanley Road in the vicinity of Flora Avenue to River Des Peres Boulevard at Watson Road. It would include an interchange at Interstate 44, which Hicks said the Missouri Department of Transportation had long wanted. The project area, according to the department, is bounded by Manchester Road to the north, Hanley Road and Laclede Station Road to I-44 to the west, Murdoch Avenue and Watson Road to the South and Big Bend Boulevard and River Des Peres to the east. The municipalities include Maplewood, Webster Groves, Shrewsbury and St. Louis. “There are very few crossing points through this central part of the county,” Hicks said. As the controversy over the South County Connector has flared, Hicks said he’s heard numerous descriptions of the project. Many of the assumptions, he said, are incorrect. Rather, Hicks said the connector could be best described as a four-lane boulevard similar to the Harry Truman Parkway in the city. He said the speed limit would be 35 miles an hour – not 40 or 50 or 60 miles an hours that he heard during a meeting. Creating a new I-44 interchange: Hicks noted the long stretch of interstate between Elm Avenue in St. Louis County and Hampton Avenue in the city that lacks a full interchange. Hicks said, “That forces motorists ... to get off the interstate, use local roads in many cases to get to the next on ramp or wherever they want to go. Reducing traffic on local roads: Hicks said motorists who are traveling north and south tend to use Murdoch Avenue, Landsdowne Avenue or Shrewsbury’s local roads. The connector, he said, would take heavy traffic off local roads. Ease the commute to Shrewsbury Metro: While Hicks said it’s very easy to get to that station from the south, it’s not as easy to get there from the west. Hicks said having an I-44 interchange close to the station would create the possibility of Rapid Bus Transit to the Shrewsbury Station. The proposal is going through what’s known as an Environment Impact Study, which is required by the National Environmental Policy Act for proposals that have significant impacts on the environment and that plan to use federal funds. As of now, Hicks said he’s hoping the $110 million project will receive federal, state and county funds. Dooley emphasized that the impact study is standard procedure for highway projects. Thus far, the project has received plenty of feedback -- some intensely negative. And while opponents have touched on a nearly endless list of concerns, some of the loudest opposition has come from Maplewood. St. Louis County Councilman Pat Dolan, D-Richmond Heights, came out against the South County Connector. At a press conference at the Deer Creek shopping center in Maplewood, Dolan said, "I don’t want to see all of this beautiful area that Maplewood took the time and money and effort to put together" just taken away." The city’s mayor and city council unanimously adopted a resolution against the connector. One reason was that it would cut through the parking lot of the re-established Deer Creek Center – which officials say cost tens of millions of dollars to build and now has tenants. Putting the connector through the center’s parking lot, said Maplewood Chamber of Commerce executive director Jeanne Beck, would reduce parking. Taking away parking, she said, would void most of the leases within the shopping center. “There are the obvious implications, like the loss of tax revenue – which we estimate to be in the excess of $500,000 both for the city of Maplewood and our school district,” Beck said. The connector, Greenberg said, will “create a noise pollution problem without any abatement plan – and no, we don’t want any ugly sound walls. “It will alter established traffic patterns and lengthen response time for police, for fire and for ambulance. It’ll undermine the investment we’ve all made in the MetroLink and severely limit our access to bicycle and pedestrian paths,” Greenberg said. Hicks said that logically the connector “would go through the parking lot,” adding “you’re not going to tear up the green space of Deer Creek for example.” But he also said it’s possible to change the plans to “lessen” the impact on the center. Asked about whether the outcry in Maplewood was justified, Dooley said, “I think the fear is probably there, but it might be unfounded. Again, we won’t know that unless they say it to us. “If there’s something about a project that you don’t like, this is the time to say it. ... So when we get ready to do this sometime down the road, we know what not to do as opposed to what to do,” Dooley said. Another source of contention is the prospect that the connector would go through River Des Peres Park in St. Louis. That worries NiNi Harris, who helped write a book about parks around the St. Louis region. She was one of dozens of people who spoke earlier this month at Southwest Baptist Church in St. Louis against the proposal. Harris said the park was conceived in 1907 with the help of landscape architect George Kessler, who she noted designed the parks and boulevard system in Kansas City. She said the park has just gone through an extensive renovation including replanting landscaping, as well as adding pedestrian walks, gates, a bridge and ornamental light fixtures. Both St. Louis Alderman Scott Ogilvie, I-24th Ward, and Board of Aldermen President Lewis Reed say that a public vote would need to occur before the connector is built through park. “I think this requires a public vote,” Ogilvie said, adding that eliminating "park space in St. Louis for a county road project” is a tough sell. Maggie Crane, a spokeswoman for St. Louis Mayor Francis Slay, said in an e-mail to the Beacon that Board of Public Service director Rich Bradley penned a letter to the parties involved expressing some of the city's concerns. Start of update: Bradley's letter -- received by the Beacon on Thursday night -- details 10 specific comments and questions about the proposal. In addition to questioning the project's impact on local trails and River Des Peres Park, Bradley wrote the $110 million price tag "is a large cost for the anticipated improvement." He went onto say that the city and county have "major road and bridge improvement needs that will compete with this project for limited resources." “We understand that the county has a traffic problem that it would like to solve with the connector, but we want to make sure that it's not at the expense of quality of life in the city,” Crane said. Hicks said, “It hasn’t been determined if the public vote will be required because the River Des Peres Park will actually have a net increase in park land.” He said the project could remove roads within the park, which in turn could be converted into parkland or parking. Beyond any individual issue, some opponents of the South County Connector – such as Ogilvie – see the project as a counterproductive expansion of roadways at the expense of bicycle infrastructure, trails and mass transit. Opponents of the South County Connector held a press conference this week at Maplewood's Deer Creek Center. Some opponents of the project – including Trailnet – pointed out that the project doesn’t include Great Rivers Greenway’s plan to connect the Deer Creek and River Des Peres Greenways. Critics say the project will “create barriers” for trail users. Mack dubbed the proposal “the Pruitt-Igoe of roads,” a reference to St. Louis’ ill-fated public housing project. Trautman also questioned the project’s impact on the Gateway bicycle plan and a proposal to build a “River Ring” of greenways throughout the region. He also said that reducing traffic on local streets could make it easier to accommodate bicyclists on local roads. In follow-up letter that was sent to Dooley earlier this month, Trautman said her group understands that St. Louis County supports the park and trail improvements to the River Des Peres and Deer Creek Greenways. Friday is the last day for public comment on the project. Hicks said, in addition to feedback from the general public, the project is being examined by state and federal agencies. If the FHWA give its OK, Hicks said the next step would be to “aggressively” target federal funds. And getting federal funding, he said, could depend on whether Congress appropriates enough money for transportation. Both Dooley and Crane said that it could be years – if not decades – before the project is built.